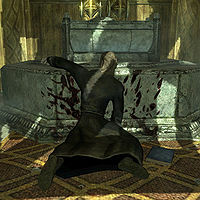 Erj is a dead Breton conjurer found in the Nchuand-Zel Armory. His notes can be found next to him. Reanimating Erj's corpse will also reanimate Erj's Familiar, a ghost wolf. This page was last modified on 27 January 2016, at 00:22.